When I add 35 lbs. to the weight of my bike, the hills become tougher. When I cycle on days with temperatures exceeding 30 degrees Celsius, I know that I have committed myself to difficult conditions. In late June, I took the early train to Holyhead intending to cycle home over two days. On my homeward journey, I wanted to seek out some notable landmarks and follow National Cycle Route number five (NCR5) that follows much of the North Wales Coast. It was still cool when I got off the train at Holyhead. 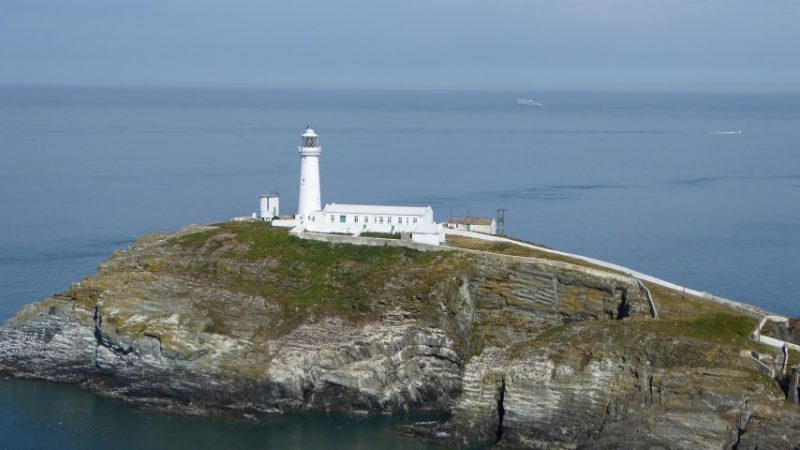 My first objective was the South Stack Lighthouse that stands at the base of Holyhead Mountain and alongside the RSPB reserve and sea bird colony. This was to be the highest, but not necessarily the toughest climb of my journey. South Stack Lighthouse. Holy Island. Anglesey’s, most Westerly point. At the RSPB café, I was greeted by a handful of the choughs that live there. I locked my bike and walked down the hill until I reached the edge of the cliffs. The sound coming from the, predominantly guillemot, sea bird colony was like a loud mechanical hum. I scanned the cliffs hoping to see other species of bird. Maybe I was too late in the season because I was unable to spot any of the razorbills or puffins that I know also nest and shelter on these cliffs. Returning to my bike, I freewheeled down the hill and crossed over Holy Island passing alongside and through picturesque Trearddur Bay before crossing onto the main island at Four Mile Bridge. That’s the name of the village; the actual bridge is only 390 feet long. I pass RAF Valley and reset my course towards my next intended lighthouse at Llanddwyn Island. The heat of the day continued to rise and I was soon starting to feel its effects. 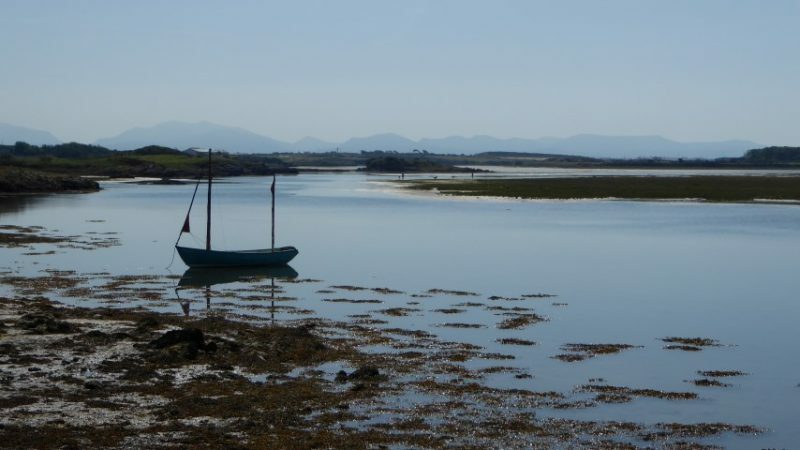 I discover that Anglesey is a difficult place to navigate. There is an absence of road signs at crucial crossroads and tee junctions and I had to consult my Ordnance Survey map at every turn. The road signs I did find were primarily in Welsh with place names that didn’t seem to relate to the names on my map. The coast is always a good navigation guide and as long as I kept it to my right, I knew that I was heading in the correct direction. The roads were narrow and quiet, the landscape was beautiful and pastoral and I occasional caught a glimpse of the sea. This made the journey more enjoyable. I wasn’t making fast progress but with increasing temperature and many hours of daylight still ahead, I needed to pace myself. Cycling along these lanes I enjoyed the peace and tranquility of roads and places that I have not experienced before. As a believer, this is my expectation of Heaven. View from Four Mile Bridge’s 390 foot long bridge. I stopped for lunch seeking shade at a picnic site at the edge of the Newborough Forest. Here I reconsidered my original plan which had been to cycle the forest tracks to the Llanddwyn lighthouse. Considering the time and the tiredness caused by the heat and the many miles that I still needed to cover, I decide that I would have to give this one a miss. By doing this, I was also giving myself a reason to come back to this beautiful place again. When I return, I’ll have more time to enjoy the place and savour the moment. I cycled on, shadowing the Menai Straits towards my intended camp site close to Anglesey’s most easterly point. I increasingly had to stop for short breaks and was struggled with heat exhaustion. The mixture of sun lotion and perspiration was running into my eyes, making them feel increasingly tired. Eventually I came to a garden centre and café, Hooton’s Homegrown Coffee Shop, where I stopped for an hour to refreshed myself with a continuous supply of tea; six cups in total. The restorative power of tea must never be underestimated. The Dawes Super Galaxy, that I use for touring. Thomas Telford’s Suspension Bridge crossing the Menai Straits in the background. Back on the road, I stop briefly at a lay-by between Llanfair PG and the town of Menai Bridge to take in the iconic view across the straits towards the Suspension bridge. 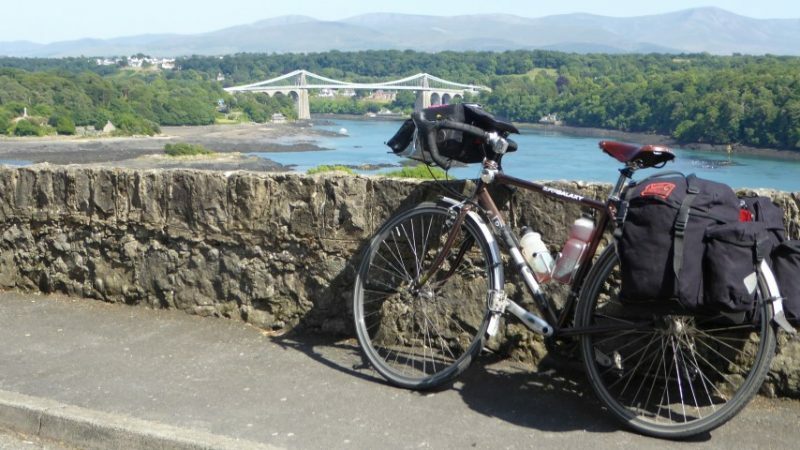 Anglesey is mainly flat, but my coastal journey is a series of gentle climbs, followed gradual downhill periods when I could choose between either freewheeling, or shifting up the gears and getting up some extra speed. Beyond Menai Bridge town, I continued to shadow the straits as I headed toward Beaumaris. There I followed the road along the front and pass the splendid castle. Then I climbed again as I headed inland towards my pre-booked campsite at Kingsbridge Caravan and Camping Park. The site is immaculately kept and its owners were helpful and friendly. I erected my tent and sorted my stuff out before freewheeling back to Beaumaris for my evening meal letting the cooler evening air pass through my body. Having cycled all day and not showered, I wanted somewhere where I could eat outside. Unfortunately, I did not follow the advice of the campsite owners and instead chose a nice looking restaurant on the front. My meal was poor and did not live up to my hard-earned appetite and after a twenty minute wait for a second pot of tea, which failed to arrive, I paid my bill and left. In defence of the three members of front house staff, they were busy and their combined ages probably didn’t add up to mine! Management was conveniently absent. Returning to camp I tried a different route back and visited St Catherine’s church at Llanfaes whose bell I’d heard earlier whilst I had been pitching my tent. Back at the campsite, I had an amazing shower. After my day’s cycling, the use of the shower facilities alone was worth the cost of the pitch. Settling down for the night, I lay in my tent listening to a tawny owl, only yards away. I haven’t seen an owl this year, but it’s always comforting to hear one so close. I came to the conclusion that it was a young one calling to be fed. Its call remained constant, at least until I fell asleep. 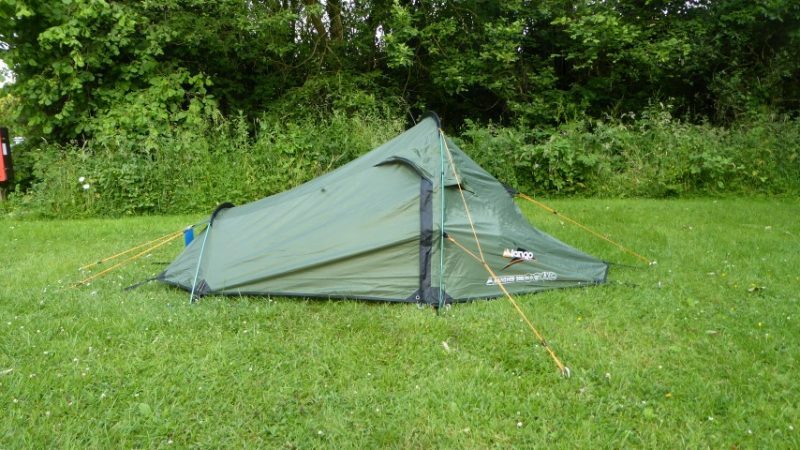 My Vango Banshee 200 tent. It’s a two man tent, so plenty of room for me and all my clobber. Previous PostChirk, Llangollen and BeyondNext PostAnglesey – Day Two – NCR5, Telford’s bridge, seaside resorts, caravan parks, a golf course, sand dunes and rumours of a ghost.